Based on his award winning 2010 book with the same title, John Logsdon will review the factors that led President John F. Kennedy, just four months after his inauguration, on May 25, 1961, to set as a national goal sending Americans to the Moon “before this decade is out.” The story of Kennedy’s Cold War decision to go to the Moon is relatively well-known; less understood are JFK’s actions and second thoughts with respect to the lunar landing goal during the remaining thirty months of his presidency. These will be explored in some depth, including Kennedy’s little-remembered September 1963 proposal to turn Project Apollo into a cooperative U.S-U.S.S.R. undertaking and the existence of a sweeping review of the U.S. space effort underway as Kennedy was assassinated that considered, among other options, cancelling Apollo or slipping the date for the first lunar landing. After reviewing this history, Logsdon will present his views on the question: “Was Apollo worth its costs and risks?” He will also relate the experience and evaluation of Apollo to current controversies regarding the character of future U.S. space efforts. His talk will be supplemented by video and audio clips of Kennedy’s speeches and White House meetings on the lunar project. JOHN LOGSDON is Professor Emeritus of Political Science and International Affairs at George Washington University’s Elliott School of International Affairs. Prior to his leaving active faculty status in June 2008, he was on the faculty of the George Washington University for 38 years; before that he taught at the Catholic University of America for four years. He was the founder in 1987 and long-time Director of GW’s Space Policy Institute. He is also a faculty member of the International Space University. He holds a B.S. in Physics from Xavier University (1960) and a Ph.D. in Political Science from New York University (1970). His research interests focus on the policy and historical aspects of U.S. and international space activities. He is author of the award-winning John F. Kennedy and the Race to the Moon (2010) and The Decision to Go to the Moon: Project Apollo and the National Interest (1970) and is general editor of the multi-volume series Exploring the Unknown: Selected Documents in the History of the U.S. Civil Space Program. He has written numerous articles and reports on space policy and history. He is frequently consulted by the electronic and print media for his views on space issues. He is a member of the Board of Directors of the Planetary Society. From September 2008-August 2009, he held the Charles A. Lindbergh Chair in Aerospace History at the Smithsonian Institution’s National Air and Space Museum. In 2003, he served as a member of the Columbia Accident Investigation Board. He is a former member of the NASA Advisory Council and its Exploration Committee. From 1997-1999, he served as a member of a blue-ribbon international panel evaluating Japan’s National Space Development Agency. From 1998-2008, he was a member of the Commercial Space Transportation Advisory Council of the Department of Transportation. He has also served on the Vice President’s Space Policy Advisory Board and the Aeronautics and Space Engineering Board of the National Research Council. 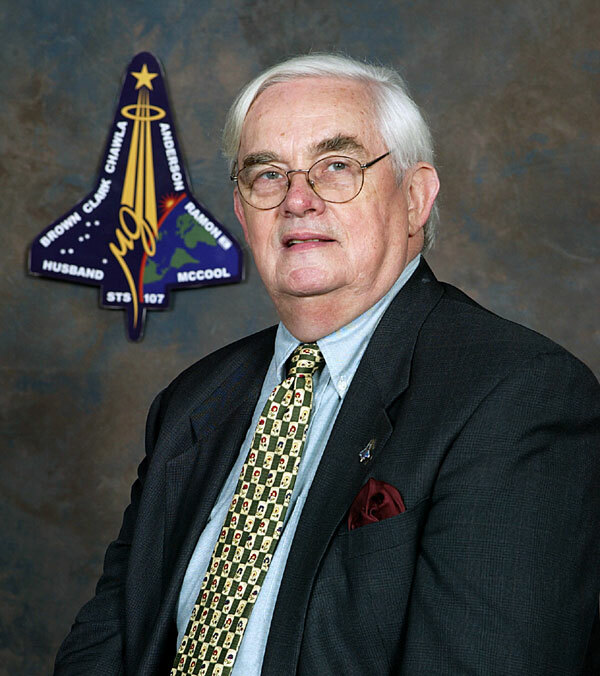 He is a recipient of the NASA Exceptional Public Service, Distinguished Public Service, and Public Service Medals, the 2005 John F. Kennedy Award from the American Astronautical Society, and the 2006 Barry Goldwater Space Educator Award of the American Institute of Aeronautics and Astronautics. He is a Fellow of the American Institute of Aeronautics and Astronautics and the American Association for the Advancement of Science. He is a member of the International Academy of Astronautics. President John Ingersoll called the 2,303rd meeting to order at 8:19 pm September 7, 2012 in the Powell Auditorium of the Cosmos Club. Mr. Ingersoll announced the order of business and introduced twelve new members of the Society, including the speaker of the evening. The minutes of the 2,302nd meeting were read and approved. Mr. Ingersoll then introduced the speaker, Mr. John Logsdon of the George Washington University. Mr. Logsdon spoke on "John F. Kennedy and the Race to the Moon." Mr. Logsdon began by noting that, as a senator, John F. Kennedy showed little interest in Sputnik or space issues, delegating those subject responsibilities to Lyndon Johnson after the election. In March, 1961 NASA Administrator James Webb suggested additional funding and goals for the Apollo project proposal and Kennedy deferred the decision on the future of a human spaceflight program. The following month Yuri Gagarin made his historic flight, which was interpreted as a great victory for the Soviet Union and convinced Kennedy that nothing was more important than regaining superiority in this context. Kennedy requested a detailed review of United States space program status, focused on political motivations and possibilities more than scientific value. The first suggested undertaking that promised dramatic results with probable success was a manned mission to the surface of the moon. Wernher von Braun correctly predicted that both the US and USSR would need a larger rocket than currently available for a successful manned moon mission, but asserted that the US could win the rocket building race and therefore achieve a moon landing first. Mr. Logsdon explained that skepticism was rampant until the successful flight of Alan Shepard, which had been originally scheduled before Gregarin's. Shepard's flight had been delayed for further tests amidst fears of possible public failure, but history could have been very different if Shepard had not been delayed. After this necessary success and extensive discussion with NASA and his advisors, Kennedy made the declaration that Americans should reach the Moon "before this decade is out." The following 30 months were spent implementing this decision in a war-like but peaceful mobilization of resources, including a near doubling of NASA's budget every year and a a massive investment in facilities and personnel. Mr. Logsdon estimates that the Apollo program, in 2011 US Dollars, cost about $155 billion and was a remarkably focused investment that is unreasonable to expect again. With funding secured, 1962 brought debate over developing plans for how to actually get to the moon. Mr. Logsdon stated that NASA preferred a lunar orbit rendezvous and Kennedy's science advisor preferred an earth orbit rendezvous. After months of dispute, Kennedy reluctantly sided with NASA's suggestion with the understanding that a failure as a result of this approach would be entirely their responsibility. There's a common belief that the Apollo program proceeded smoothly and without political roadblocks after being announced. But even as Kennedy's most famous speech in support of the program was being given in September 1962, NASA was internally debating how much money to spend on Apollo and experiencing management and budget issues. Kennedy and Webb met to discuss the motivations for the program and, in 1963, NASA's budget was nearly cut by Congress in response to growing unease regarding Apollo's chances for success. Kennedy also considered turning Apollo a cooperative undertaking with the Russians and worked on cooperative proposals, inquiring at least twice during meetings with the USSR if they were interested. Kennedy even publicly proposed cooperation during a speech to the General Assembly of the United Nations. Mr. Logsdon believes that the USSR might have undertaken a collaboration if Kennedy had not been assassinated shortly afterward. With historical hindsight, we now know that the Soviet Union did not approve their manned lunar program until 1964, so while Kennedy was alive we were effectively only racing ourselves. It is unknown exactly how Kennedy would have proceeded with the space program had he lived, his original decisions were based on Kennedy's assumptions of American exceptionalism and that space capabilities were critical to both hard and soft power. Apollo's eventual success capped a terrible decade in United States history, bringing a sense of prestige and achievement that encouraged optimism for future programs. Howerver, Mr. Logsdon believes that the conditions for Apollo's success would be difficult to reproduce and that the Apollo program experience was perhaps unique. Someone wondered how did "end of the decade" mean? The original draft said 1967 and there is still controversy over who suggested the extension. Doesn't believe they defined it exactly. Someone asked about Kennedy's priorities in peace or warlike usage of space. Kennedy believed in controlling the growth of armaments into space and focused on peaceful applications of space programs such as weather and communications satellites. After the question and answer period, Mr. Ingersoll thanked the speaker, made the usual housekeeping announcements, and invited guests to apply for membership. At 9:59 pm, President John Ingersoll adjourned the 2,303rd meeting to the social hour.